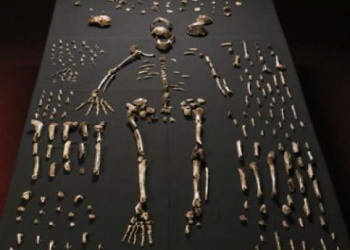 JOHANNESBURG, South Africa, September 11, 2015 (ENS) – A new species of human relative has been discovered in a remote cave chamber known as Rising Star in the Cradle of Humankind, some 50 kilometers (30 miles) northwest of Johannesburg. Scientists have named it Homo naledi. Besides shedding light on the origins and diversity of humankind, H. naledi also appears to have intentionally deposited bodies of its dead in a cave, a behavior previously thought limited to humans. 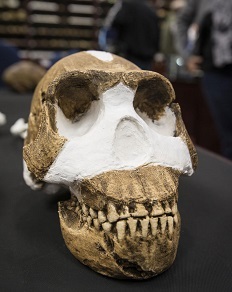 The fossils were revealed Thursday during an international launch at the Maropeng Visitor’s Centre in the Cradle of Humankind World Heritage Site. The event was attended by representatives from the South African government, participating researchers from all over the world, as well as local and international media. 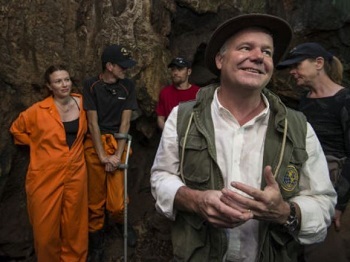 The revelation has been anticipated since Professor Lee Berger, research professor in the Evolutionary Studies Institute at University of the Witwatersrand, Johannesburg, and a team of researchers, cavers and explorers, announced in November 2013 that they had made a significant fossil find. They launched the Rising Star Expedition and have since then discovered more than 1,550 numbered fossil elements, the discovery is the single largest fossil hominin find yet made on the continent of Africa. A hominin is a primate of a family (Hominidae) that includes humans and their fossil ancestors. So far, the team has recovered parts of at least 15 individuals of the same species, a small fraction of the fossils believed to remain in the chamber. “With almost every bone in the body represented multiple times, H. naledi is already practically the best-known fossil member of our lineage,” Berger said. The fossils, which have yet to be dated, lay in a chamber about 90 meters (some 100 yards) from the cave entrance, accessible only through a chute so narrow that a special team of very slender individuals was needed to retrieve them. That room has “always been isolated from other chambers and never been open directly to the surface,” said Dr. Paul Dirks of James Cook University in Queensland, Australia, lead author of the eLife paper on the context of the find. “What’s important for people to understand is that the remains were found practically alone in this remote chamber in the absence of any other major fossil animals,” Dirks said. Of more than 1,550 fossil elements recovered only about a dozen are not hominin, and these few pieces are isolated mouse and bird remains, meaning that the chamber attracted few accidental visitors. The team said the bones bear no marks of scavengers or carnivores or any other signs that non-hominin agents or natural processes, such as moving water, carried these individuals into the chamber. “We explored every alternative scenario, including mass death, an unknown carnivore, water transport from another location, or accidental death in a death trap, among others,” said Berger. “In examining every other option, we were left with intentional body disposal by H. naledi as the most plausible scenario,” he said. The announcement of this discovery coincides with the publication of two papers in the scientific journal eLife and reported in the cover story of the October issue of “National Geographic” magazine.